THERE was definitely no way a marina in Manchester was accepting Ben Harratt's idea of a boat when he craned it in to berth it. 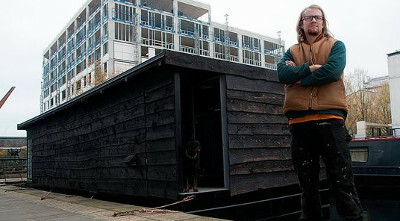 Being nothing more than a wooden shed it could not be considered as anything like a boat, not even having an engine or anything resembling a boat, with nothing inside it, so the BWML people who manage New Islington Marina said no, reports Alan Tilbury. The wooden structure that as yet is only a shell, took months to build at a cost he relates of £80,000 when it is eventually fitted-out at a workshop near the marina, it being his full time job, and even employing others to help with the construction. He had a mooring in the marina for his previous boat, but this new construction could not even navigate the waterway it being so big and had to be craned in then towed to the same berth, but when the management saw it he was ordered to take it away, being told it cannot be classed as a canal boat. Bens' answer to the decision that he has to take his construction away was that he is 'being punished for his innovation and due to some people's warped views of what a canal boat should look like'!